Good day peoples, been ready the forums for about a year and first time poster. I bought the her not running last year. This forum have helped me a ton to get to the point I’m at now, but I’m stuck now. Ive been able to ride her but I have this charging issue that I’ve been dealing with no end in sight. I’m on my 3rd rotor this year and I cant figure out wtf my bike keeps burning them out. At 350$ a shot I’m running outa patience and money quickly for this project. My regulator/rectifier and stator are new and still test good. But my rotors keep burning out. I’ve gone over the mess of wires that the PO made thinking that maybe there is something in the wiring doing this. Be able to help me out. I know the charging system on these bikes are one of their biggest flaws but 3 in one year seems a little excessive. Thanks for the reply Ox, first rotor that went out took the original rectifier with it so that had to be replaced. Rotor tested 5.2 ohms after install. Tested battery for charging at rpms 5k rpm was 14.7v on the battery. So that to me tests good. Didn’t finish one ride out of it. tests 1.2ohms now. Previous one same thing tested 4.7ohms after install same thing not even one ride and burnt out. It doesn’t make any sense to me. Only questionable things I can find are that wiring in last post picture and my ignition switch. Before you replace all your electrical components again, we need to sort out that wiring harness. Something in there is probably what is messing everything up. With regards to your picture, the green wires are all ground wires, so they are fine like they are. One of the green ones should connect to a tab inside the headlight bucket. The brown is an extra hot wire that is normally inside the headlight bucket. It is for aftermarket running lights or anything else you want to run power to. Where does the black wire to which it is connected go? You mention a problem with the ignition switch, but don't say what the problem is. Thanks for the reply Folsoml. The black wire is in the same “lights” section of harness as the brown wire together with the red crimp in the photo. On the last ride mid way through, we stopped for a bit to enjoy some sceneries. Get back on and noticed the key in the on position had to be in a certain spot for the console to light up. The key switch can potentially be fix just by turning it on and off about fifty times. Sometimes they get a bit of corrosion on them and this will clear it off. 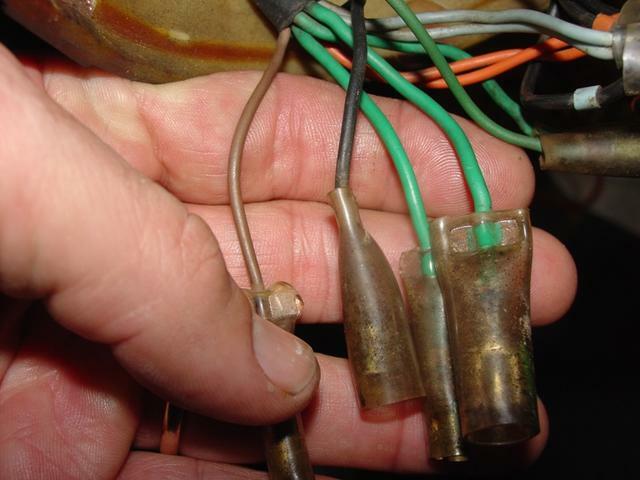 These are extra wires that should be inside your headlight bucket. Thanks for the help I’ll chop that crimper and cap off the wires. Do you think that would cook the rotors? I’d think it would blow a fuse or melt the wires. I would think it would blow a fuse, but what else has the PO done? Have you checked the fuses--even the back side of the fuse holder? Maybe they bypassed it somehow. what about the main fuse on the starter solenoid? It's hard to find one these days that someone has not replaced that fuse with a piece of wire. New rotor is in but I’m in not rush to get it in this time. I’ll be working over the winter on it and have it ready for summer. Thanks for all the input and help.